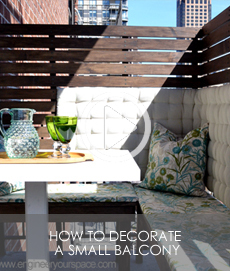 This makeover is full of small balcony ideas you can use, especially if you live in a rental apartment and can’t make any holes in the walls or if you’re on a budget! My friend Lisa asked for my help to transform her less than fabulous small rental balcony into a cozy inviting outdoor space to enjoy with her dog Leo. The first project I tackled was transforming an odd opening into a beautiful custom feature, all for less than $65. Then I built a DIY custom bench which only cost $35 in materials and became a comfy place to lounge thanks to some inexpensive outdoor cushions from IKEA. I came up with a clever way to install a trellis without making any holes in the walls and I also made a special table that is a great space saving idea for tiny balconies. I added lots of plants, including a gorgeous staghorn fern, and last but not least, I installed smart outdoor LED lights to add some ambiance in the evening. The end!